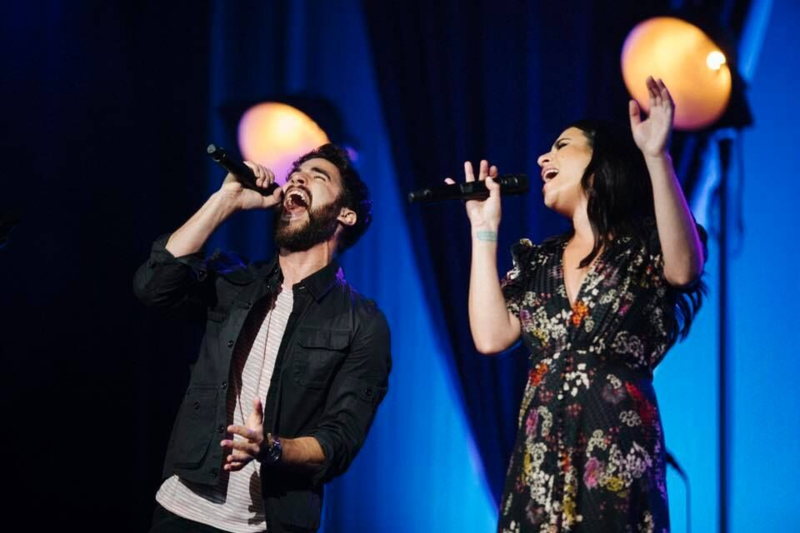 Lea Michele and Darren Criss In Concert: Hammersmith Apollo and touring. (seen at the evening performance on 2nd December 2018). Or “Rachel Berry” and “Blaine Warbler” to Gleeks. Either way, this pair of young American entertainers gave us a pretty interesting insight into the current state of the US light entertainment scene, and its populous in general. Over almost 2 and a quarter hours they ran the spectrum from Sondheim to Lady Gaga, via Judy Garland and Keane, with almost unwavering success and always striking energy. The same could be said of a (mostly young and female) audience who reacted to everything with matching gusto, adding much to the event. Kicking off with “Broadway Baby” (from musical “Follies”) as a duet, and moving on to a hugely successful “Suddenly Seymour” (“Little Shop Of Horrors”); then came my first real surprise – Darren Criss grabbing a guitar and picking out… “Falling Slowly” from “Once.” One of my favourite musicals of all time, and the pair gave it a treatment it absolutely deserved. Mr Criss then left the stage to Ms Michele and her vocal potions (all non-alcoholic, she assured us, and we sort of didn’t stop believing it – enough “in” “Glee” jokes – editor). A friendly interactive chat had her delighting all with snatches of songs suggested by the audience. Then, she truly unleashed the power. Eva Cassidy’s version of “Over The Rainbow” was nothing short of sensational, Michele’s soaring vocal a chocolate coating perfection. Following it up with ‘signature tune’ “Don’t Rain On My Parade” brought the house down, and rightly – would have been amazing if she had ventured into the aisles but alas, not technically possible. A pair of “Glee” favourites, “Poker Face” and “Edge of Glory” were nostalgic fun, before a personal “Glitter in the Air” reminded us just how good her voice is, compared with the original “Pink” version. 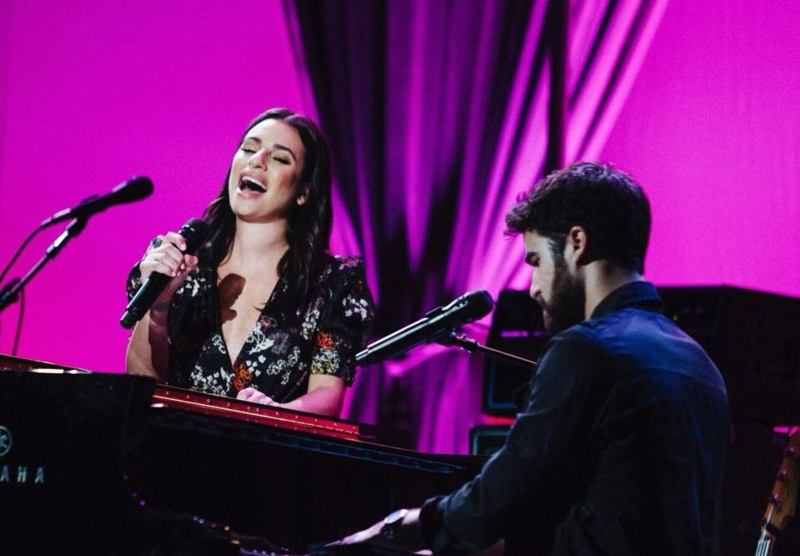 “Run to You” from her album gave way to a ‘thrown in for the season’ delightful stool-bound “Have Yourself a Merry Little Christmas” full of seasonal cheer, before joining Darren Criss again for “Getaway Car” and Darren’s section of the show. Though admitting to not being a musical theatre person, “Hopelessly Devoted” has to be his audition for any re-make of “Grease,” while “I Dreamed A Dream” self-accompanied had hallmarks of Michele coaching, and was deeply satisfying. As a song-writer, his own “Going Nowhere,” “Foolish Thing” and “Not Alone” got a look-in, the last probably the strongest of the self-penned material. The encore stripped the show back to just their voices and a guitar as the vast auditorium demonstrated its acoustics and the artistes their skill with an un-amplified “Don’t You Want Me” by “The Human League.” Well, actually, we do. Sure, there are criticisms. Foremost was the constant, utterly unnecessary swearing. There were younger children in the audience… and if “Blondie” in the same auditorium could keep it clean, so could this pair. Except that they didn’t. Second, the weird solipsism of young America wasn’t well hidden. For a pair of international stars anchoring a world tour, that was odd. A fair proportion of the audience chat was thanking us for being there, and noting how many people are from Europe. Their slight amazement that anything existed outside of the lower 48 states grated after a while, spoiling the illusion of sophistication somewhat. Finally, a note to Mr Criss that “Les Misérables” the musical was developed in Paris and opened in 1980 (the song you sang existed, in melodic form at least, even back then) and hit London in 1985, not 1987 as stated. Rachel Berry should be very disappointed in you. Still, the duo worked hard, and are clearly besotted with each-other’s talents, which is good to see. Well selected songs, a more than decent live band backing them, and a few “burned into the memory forever moments.” What more could anyone want to believe in? Let’s hope they don’t stop, for sure. Photos supplied by kind permission of Hush PR. All rights reserved by them.